Well when I thought about this parable I didn’t think of anything nerdy at all but I did think of something nostalgic. I thought of my favorite show from way back when DuckTales, with the main protagonist Scrooge McDuck. If you are reading this and don’t remember I highly suggest looking the show up on YouTube or checking out the comics. Scrooge McDuck, in the show is the richest duck in Duckburg. He has so much money that for fun he swims around in it in a gigantic money bin filled with gold coins and jewelry. But out of all of the coins he possess his most important coin is his number one dime. The first coin he has ever earned. It is so precious to him that he keeps it under glass. However, there is someone who wants it for sinister needs. Her name is Magica De Spell and she is a witch that believes that coin has the power to bring her power and great wealth. Since it’s not just any dime Scrooge goes after it and seeks it out from Magica. Reminds me of the parable above. When Jesus speaks to the masses and his disciples and he wants to give them a message that he wants them and us to easily understand he crafts parables. In this parable he describes a woman who have ten silver coins and loses one and she looks all over the house for it. After meticulous searching she finds the coin and calls her friends and neighbors over to celebrate the reclamation of what she lost. That joy she felt. That joy you and I would feel in that same situation is what the angels of heaven would feel when we win someone over from the darkness and bring them into fold of being obedient with God. If you watched a few episodes you can definitely see that when that dime is stolen from Scrooge McDuck it’s never easy to get back. It’s a painstaking journey filled with mystery and danger. But the danger is worth it because there’s value in that dime. Even Magica De Spell sees the power in the dime. That dime have changed the life of Scrooge McDuck and Magica believed that it could change her life if she was able to get her hands on it. Just like that dime has power we have power too. We have the power to change lives as well. Will we change the lives of others for the better as what the dime have done from Scrooge McDuck. 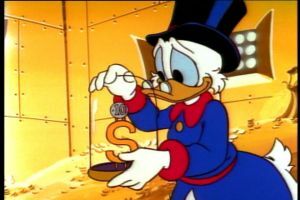 Scrooge McDuck from the dime understood the value of a dollar, learned what hard work meant and that learned that he must be ever vigilant if he wants to grow and succeed. Under the control of Magica for a time the dime gave her great influence to even grant her company with Flintheart Glomgold and the Beagle Boys, antagonist of the show. It’s the power of influence we have that we are just like the number one dime and the silver coin. The angels rejoice because we saved one from the enemy. We have added someone else that can bring glory to God and can bring others into the fold. As the angels rejoice we should too. Heavenly Father, thank you for teaching me that I have value worth celebrating over. When I was lost you have found me and celebrated me upon my return to you. I am so thankful that you watch over me even when I have drifted away from you. I promise that I will stay faithful and use the influence I have to bring more of the lost back to you. In Jesus name, Amen.